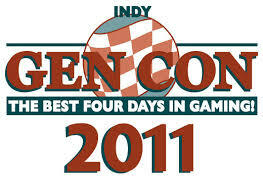 Gen Con 2011 was fantastic. I want to write about a number of aspects of the convention, including Ashes of Athas and my personal experience. I ended up spending a bit of time collecting information on new Wizards product offerings, so I’ll start here first. The Tome Show recorded all of the Gen Con Wizards of the Coast seminars. These are very good seminars worth your time. Online DM transcribed the New Product Seminar, which makes for a nice companion while listening. Critical Hits pulled together an overview of the New Product Seminar, including some great pictures of the slides (and of the new dragon set). It would be easy to expect very little in the way of releases, as Wizards has cut back on player content. However, their new product and DDI seminars reveal a lot of new products that will appeal to players and DMs alike. As a guy with a beholder icon (a playtester), I may know a few things but I’m sticking to information that is available from other sources. Where possible I try to add bits that most sites may not have mentioned. Kara-Tur in DDI: I was involved on the Dungeon side… I’m hopeful everyone enjoys the adventure! Drizzt Board Game: continues the well-received adventure system series of Castle Ravenloft and Ashardalon, adding new PCs, play innovations, etc. It had good reviews from players trying it out in Sagamore and will be at PAX. Dungeon of Dread: Canceled board game. Was scheduled for December, no longer on schedule based on playtests. I tend to think cancellations are a good sign of quality standards. Lords of Waterdeep: It bears underscoring that this is a board game unlike Castle Ravenloft/Ashardalon/Drizzt. It is more of a Euro style board game and I only hear/see positive things. It is a competitive game where you are one of the masked lords and can hire adventurers and choose from different tasks to gain victory over the other lords. Trivia: It started at the very beginning as being based on Dark Sun, but I agree it works best as being based on Waterdeep. Gardmore Abbey: Has a book on story, quests, patrons, villains, etc. Open-ended large adventure with cool ways the NPCs change in various ways to reflect PC choice. Has the Deck of Many things (which plays a strong role throughout the adventure) and other cool unique aspects. Deliberate attempt to be non-linear. Two battlemaps, deck of Many Things, several books. There is a preview adventure at PAX. Mordenkainen’s Magnificent Emporium: Book includes magic items with rarity, some rewrites, plus non-magical equipment, hirelings, and other fun aspects. Had extensive playtesting. Encounters: New season starts this week (on August 10). Preview gameday ran nationwide and at Gen Con. PAX will run the first three sessions. Close integration between published material (Neverwinter, Feywild, Elemental) and the season’s adventure. Lair Assault: Really cool-looking materials, so judges may be really looking forward to running these! The events page has info, but it is a high-challenge series of adventures released every couple of months and you play at game stores whenever you schedule them with the store. Super-hard, with the idea being that players may need to try several times before they win. Neverwinter Campaign Setting: Completely and utterly awesome. Everyone is raving about the quality of this book and desiring to see it used in LFR. It is also ideal for home campaigns. It is on sale now and a judge reward. (By the way, we need more Gen Con judges 😉 ). Feywild: There is a book with many player options (including a flying race – the pixie, as well as hamadryad and satyr, plus support for fey races), also Encounters season (based on the old UK1 Crystal Cave adventure) that works off of it. WotC staff actually playtested some of the races and classes at D&DXP Ashes of Athas tables (and we hope they tuned the power level down… those were strong!). Tiles: Shadowghast Manor (haunted house) and Cathedral Chaos (cool strange passageways) are two new themed tiles sets. Idea is that the Essentials tiles free them up to make interesting themed sets that add variety to the core sets of tiles. Map Packs: 3 double-sided poster maps (one from previous adventures), same price as tiles ($11.95). Book of Vile Darkness: Evil campaigns. Includes player and DM content so you can have a balanced, interesting, and non-destructive campaign. Double-sided poster map. Linked to the movie. Undermountain: Cool adventure supporting dungeon crawl or story-based. Written by a certain former LFR global admin. Comes with cool maps. Digital offerings: Some discussion around offering material digitally. By mistake James Wyatt shared that they will offer one fee ($10?) for one year of digital access to 10 Eberron sourcebooks. May be an experiment designed to assess how best to release other material. The number of WotC staff saying they are close to offering things digitally is increasing. Gamma World: WotC seems happy with what is already released, though I see them watching this for interest levels to do more. Stay tuned and let WotC know if you want more (and would buy more). Minis sets: The Dragon set will be similar to the beholder set, where you get several dragons in one collector-style box. 5 chromatic dragons, including new ones, out in October. Limited edition collector set. A skirmish minis game is being designed and there may be an open playtest very soon for it. There will be other non-random sets, seems like based around encounter or theme ideas. This is all made especially interesting in light of Paizo announcing roughly a week ago that they will offer a random distribution minis set priced a bit higher than most D&D mini collectible sets (40 minis for the December set at $274 for a case! 60-figure set in June 2012). The reaction by Paizo subscribers seems uncommonly negative (maybe 50% negative, which is really high for them). I am not particularly impressed by the pictures I’ve seen (the paint job looked simple and flat), though the actual Paizo player minis (a set of four) looked good in person. Either way, minis purchasers have options and this should be an interesting comparison of approaches. The success or failure of Paizo’s random minis and of WotC’s smaller non-random sets will likely be closely watched by both companies as well as other minis manufacturers (if you haven’t been following sources like the Going Last podcast, minis manufacturers have been raising prices, changing materials (metal to resin, etc.) and experimenting with different strategies to fight costs). Paizo/Pathfinder: They also saw big increases in attendance. That’s great, because it is nice to see gamers of all kinds grow the hobby. It does, of course, also mean there is no end to edition wars. In related news, Pathfinder Society let Hyrum Savage go in late July, but it is unclear what a change at the top of campaign management means. Overall, Pathfinder continues to be strong. ICV2 (always suspect) just claimed today that Pathfinder has outsold WotC in Q2 2011. While the figures are suspect and ICV2 is accused by many of fabricating news, the reports from various gaming stores suggest this is plausible. Paizo’s subscription model is incredible. But, there are those that say not counting the big distributors correctly could throw off all of ICv2’s estimates. For other systems, I saw some moderate growth for other settings like Eclipse Phase, Crafty Games rpgs, and Catalyst/Shadowrun. 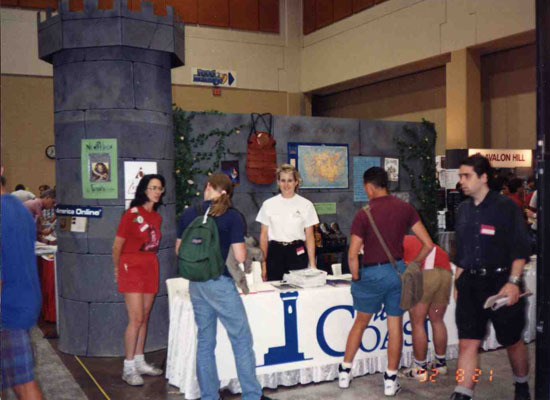 Oh, for fun, check out this picture Paizo CEO Lisa Stevens posted of her at the first Gen Con WotC booth! Ennies: Paizo continued its dominance over WotC, though of course the Ennies are not science and reflect how fans tend to vote (often unfairly). Best humor moment: Mike Mearls says that the person writing on the forums that he should be fired is probably his wife. Classic. I keep randomly running into him on my way to the airport. He’s a terrific guy. If you listen to just one part of the Tome podcast, make it the Q&A where Mearls just talks for a while. D&D is in good hands. This entry was posted on October 11, 2015 by Alphastream and tagged Conventions, Gen Con, Miniatures, RPG History.